This week’s column will start with a few more words on FDA, sequester, and the House “sequester alternative” passed last week and discussed in last week’s Analysis and Commentary. We will then take a quick look at the situation in the Senate. The sequester alternative passed by the House last week is better for non-defense discretionary spending but the difference may be viewed as marginal. It is definitely not a solution. Under the sequester, FDA faces potential across-the-board cuts in the 8% range (about $200 million). Under the House alternative, the cut might be more in the range of $150 to $170 million and there is a chance that the Appropriations committee might choose to find savings in programs other than FDA. These are just negotiating positions for the House relative to budget discussions that will need to be held with the Senate in the post-election session. Although there may well be a few dollars difference between sequester and the House alternative, the only thing to feel hopeful about is that mandatory program spending is finally on the table. If some type of tax reform were also part of the package, then it is possible that the burden of deficit reduction imposed on FDA and similar agencies might actually lessen when talks finally get underway. Meantime, the FY 13, pre-sequester funding situation for FDA is starting to become clearer. 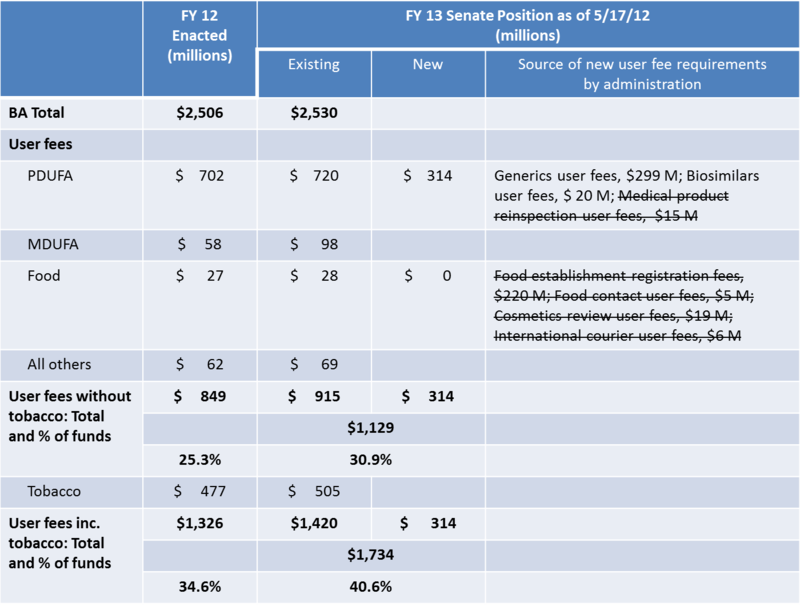 Below is a chart that compares FY 12 with a “pieced together” look at the Senate position. It is based on the actions of the Appropriations Committee, the CBO score of the Senate PDUFA reauthorization bill, and indications of the likely fate in the Senate of various revenue elements requested by the President. The chart should not be taken literally — rather it is a status check based on a couple of different Senate sources. Its assessment of the relative relationships between appropriations and user fees is also probably fairly accurate. On the other hand, the exact amount that the reauthorized PDUFA program will raise in FY 13 is a slightly different amount in three different sources. The number used here is the one in the Senate CBO score.